Christianity is the world's biggest religion, with about 2.2 billion followers worldwide. This monotheistic religion is based on the teachings of Jesus of Nazareth who later became known as Jesus Christ because his believers think he is the Son of God. Jesus was crucified around 33 CE in Jerusalem—a very important city to Christians. Old Jewish writings said a leader would die and rise from the dead to lead the people. Christians believe that Jesus rose from the dead and appeared to his disciples (followers), which made him the Messiah (Savior) promised in the Old Testament. Most people who lived in the time of Jesus did not believe he rose from the grave. Today, Jews are awaiting the coming of a Messiah or Savior, while Christians believe that Jesus Christ was the Savior. Christians belief in God is complicated. They believe in God, Jesus, and a spirit form of God called the Holy Spirit. Christian's belief in God is what is called the Holy Trinity—the Father, the Son, and the Holy Spirit--they believe these are 3 forms of the same "God", similar to how water can exist in 3 forms of liquid, gas (water vapor), or solid (ice). Christianity originally developed as a part of Judaism. Jesus was a Jew who was born in 1 CE in Bethlehem. Most of his life is a mystery, as there are no records of his life except his birth, a brief time in his yearly childhood, and 1-3 years of adulthood when he preached and was crucified. Christianity didn’t just happen immediately. For nearly 100 years Christianity was a denomination of Judaism, and a very unpopular one at that. The few followers of Christianity were the family of Jesus and the few apostles that were still alive. 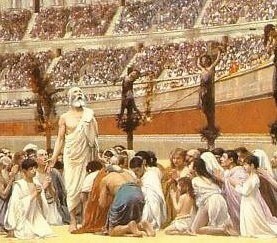 Jesus preached new ideas that many Jews and Romans viewed as rebellious--it was dangerous to be a follower of Jesus. The number of followers greatly increased when Romans began to convert to Christianity. Jesus lived for 33 years before being crucified by the Romans. Early Christians were not popular with Jews or Romans. 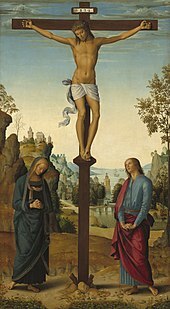 Many of Jesus's apostles were executed such as Peter who was crucified upside down in 64 CE or James who was crucified, then stoned, and finally beaten to death by wooden clubs. Persecuted means they were treated badly or harassed. However, by the year 391 CE Christianity became the most popular religion in Rome. The Roman Empire spread Christianity to Europe and over the next 1000 years Europe developed the most powerful kingdoms as Rome lost power. These kindoms such as England, France, and Spain explored the world and spread the Christian religion in the colonies they made such as in America, Africa, Australia, and South America. The Christian place of worship is called a church. They are often built in the shape of a cross with the altar facing east towards the rising sun. Christian spiritual leaders are called priests or ministers. Christians believe priests have a special relationship with God. The Bible is the Christian holy book. It is divided into the Old Testament (Jewish book) written before Jesus and New Testaments. Most versions of the New Testament have 27 "books" or parts. They were written in Greek, some were written over 100 years after the time of Jesus. The first parts of the New Testament were written about 20 years after Jesus was crucified, about 51 CE to 80 CE, however, Christians believe the writing was inspired by God. The New Testament was finally put together as it is today in the mid-300's CE. There are many stories or "gospels" not included in the official Christian Bible. There are different branches or denominations of Christianity because some Christians worship in different ways and believe in different parts of the Bible. There are 3 main denominations in Christianity--Roman Catholic, Easter Orthidox, and Protestent. Each denomination is further divided. Methodists, Mormons, Baptists, and Quakers are just a few of the dozens (maybe hundreds) of Christian denominations. They all worship in different ways, different times of the day, saying different prayers, and believing different things, but most believe in certain core ideas such as heaven, and the resurrection of Jesus. The most important Christian holiday for all Christians is Easter, which celebrates the resurrection of Jesus.